Quality, rustic sleepers that are ideal for making raised beds. These are made from sustainably sourced heartwood Larch and are untreated (no nasty chemicals), making them perfect for vegetable gardening. These rustic, unplaned, sustainably sourced sleepers are a great way to add real character to your garden and create unique looking features, such as lovely raised beds for plants or veggies. Our sourcing policy really sets us apart, as our aim is to make beneficial use of arisings that would otherwise likely not be used in an environmentally efficient manner. We want each piece of timber to be used to its best potential, and we do it! Our sleepers are supplied in the standard cross section of 200mm x 100mm x (2400-2500mm). The sleepers are made of heartwood Larch and are ideal for making raised beds: unlike treated sleepers, ours contain no chemical preservatives that might leach into the ground and so are ideal for vegetable gardening. 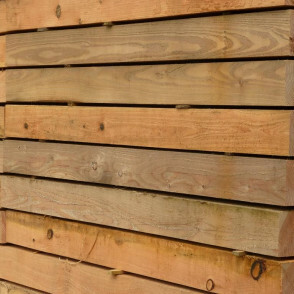 We primarily mill these sleepers from Larch, and occasionally from Douglas Fir when we get some in, but can mill Oak sleepers too with notice – Oak prices will vary, so please give us a call to discuss. We currently make sleepers in this standard ‘full-size’ as well as in a half-size and quarter-size, which may be better suited for use in more petite gardens. We can mill other sleeper sizes on request. To discuss these possibilities, please get in touch.